Sister Mary Peter Kerwin, D.C.
A Mass of Christian Burial for Sister Mary Peter Kerwin, D.C., was celebrated Feb. 13, 2016, at the Daughters of Charity DePaul House Chapel in Albany, N.Y. Burial followed at St. Agnes Cemetery in Menands, N.Y. 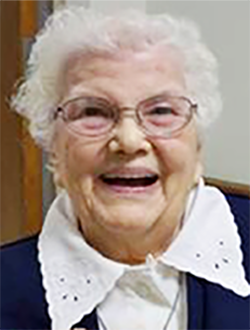 Sister Mary Peter died Feb. 8, 2016, at St. Louise House in Albany. She was 91 years of age and 70 years vocation as a Daughter of Charity of St. Vincent de Paul. Born in Natick, Mass., July 28, 1924, Sister Mary Peter was one of four children born to Peter Joseph and Agnes (Gallagher) Kerwin. Sister graduated from Millis High School in Millis, Mass., in 1942 and entered the Daughters of Charity in March 1945. Sister Mary Peter earned her Bachelor of Arts degree in English in 1965 from St. Joseph College in Emmitsburg, Md. Following initial formation, Sister Mary Peter served at Seton Villa in Wilmington, Del. (1945 to 1948); St. Charles School in Pikesville, Md. (1948 to 1956); Our Lady of the Miraculous Medal School in Greensboro, N.C. (1956 to 1958); St. Michael School in Overlea, Md. (1958 to 1967); St. Joseph School in Martinsburg, W.V. (1967 to 1968); St. John’s School in Albany (1968 to 1969); St. Catherine Labouré School in Harrisburg, Penn. (1969 to 1971); Our Lady of Lourdes School in Utica, N.Y. (1971 to 1975 and 1983 to 1985); Cathedral School in Syracuse, N.Y. (1975 to 1978); Carney Hospital in Boston, Mass. (1978 to 1981); St. Margaret’s Hospital in Dorchester, Mass. (1981 to 1982); as a docent at the National Shrine of St. Elizabeth Ann Seton in Emmitsburg (1982 and 1992 to 1995); St. John of God Hospital in Brighton, Mass. (1982 to 1983); Our Lady of the Blessed Sacrament in Bayside, N.Y. (1985 to 1987); St. Vincent’s in Albany (1987 to 1991); St. Louise House in Albany (1991 to 1992); and Sisters of Charity Hospital in Buffalo, N.Y. (1995 to 2001). In 2001, Sister Mary Peter joined the Ministry of Prayer at St. Louise House in Albany; she served there until the time of her death. Sister Mary Peter was preceded in death by her parents and siblings. Sister Mary Peter’s aunt, Sister Winifred Kerwin, D.C., also was a Daughter of Charity. She died in 1995. Sister Mary Peter is survived by her sister-in-law, Ida Struck of Millis, Mass. ; a niece, Beth Ramey; many nieces and nephews and grandnieces and grandnephews; her Sisters in Community; and many friends.